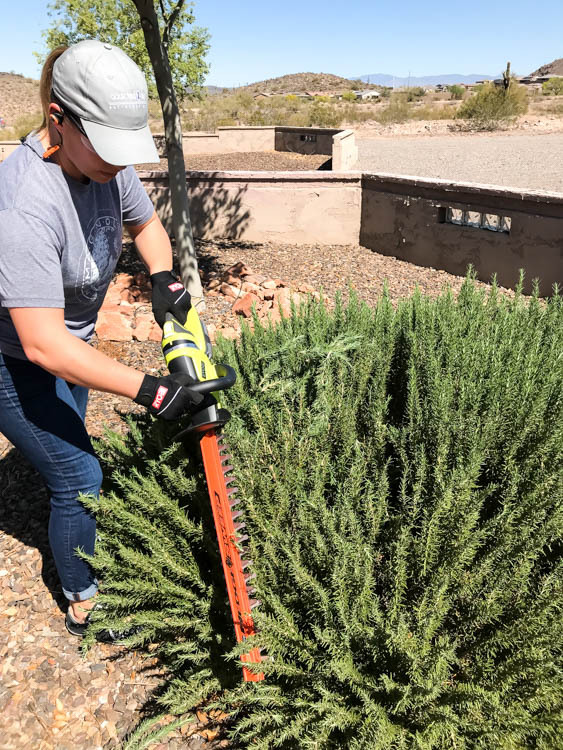 Spring has sprung and, while some may still be dealing with blizzard conditions, here in Arizona we’re dealing with gorgeous temps that are making us want to spend more and more time outside. 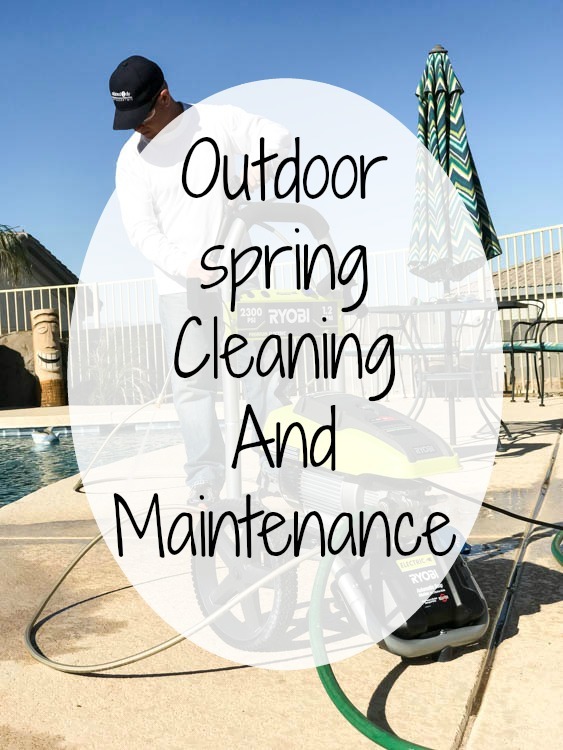 It’s also the time of year when we start our spring cleanup and maintenance outside. 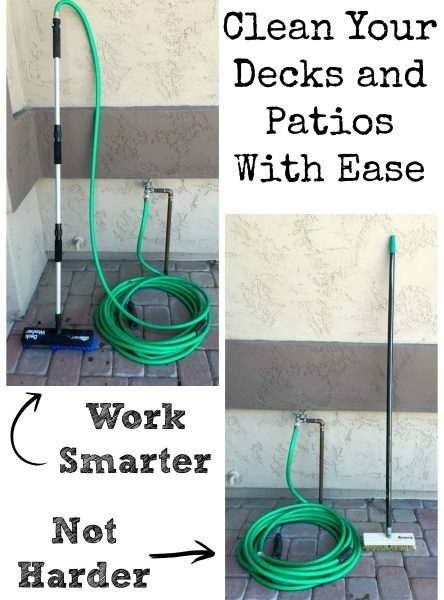 That means, starting to get the pool area prepped for summer, trimming up the trees and bushes, and also spraying for bugs. Warmer weather, means the bugs will start coming out in force and we’ve got to do what we can to set up a defensive perimeter. 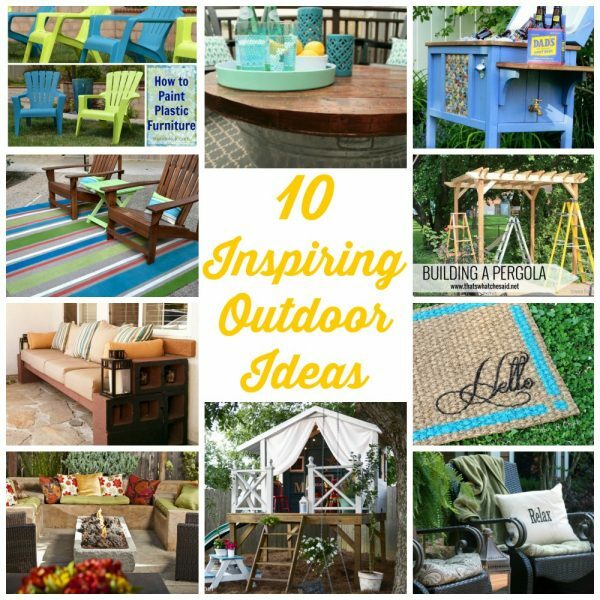 I’m teaming up with RYOBI Outdoors today to share with you all of the ways we’re getting our outdoor spaces ready. Living in the desert, we have quite the variety of bugs that come out of hiding as the weather warms up. Between the scorpions, the spiders, and the centipedes, it’s a lot to try to keep away from. 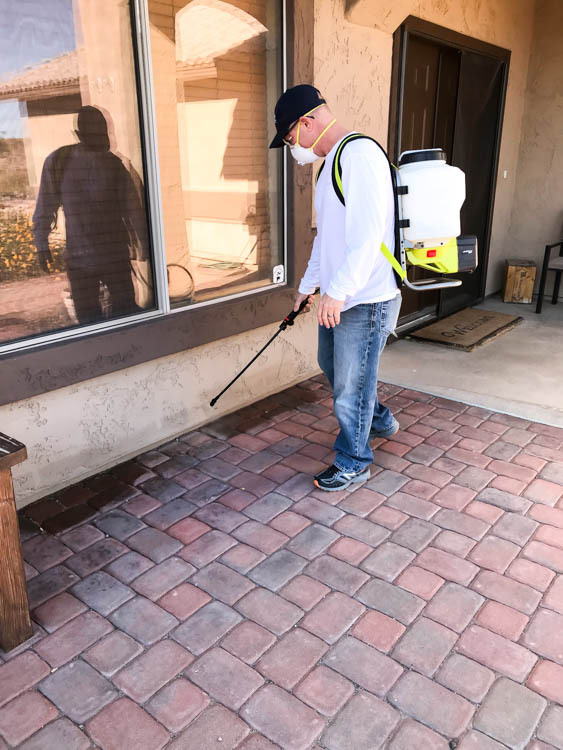 While hiring a pest control company is always an options, we actually prefer to do it ourselves. 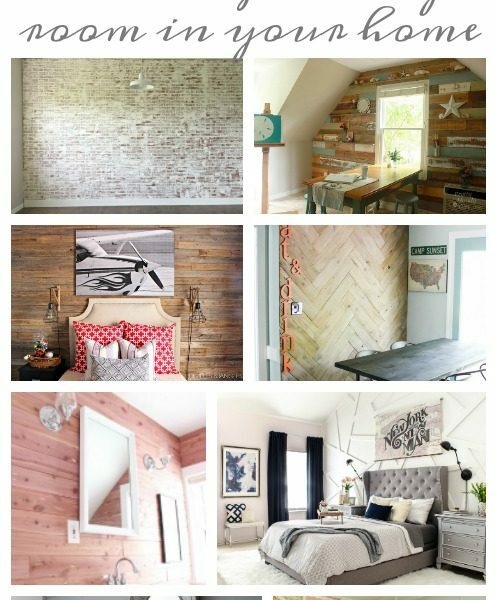 It’s cheaper, and we can do it on an as needed basis, rather than trying to schedule monthly maintenance. Typically, the second my husband spies a spider or a scorpion, he’s in the garage immediately prepping to spray. The RYOBI 18V backpack sprayer is an awesome tool for both bugs and weeds. It’s 4 gallon capacity means you don’t have to spend a lot of time refilling it. The 18V battery-powered motor means you don’t have to get a crazy arm workout by constantly pumping it up. Warmer temps also mean hours spent poolside (with gallons of sunscreen, of course). Our kids have already braved the cold waters once this year and it won’t be long before they are swimming every day. Our pool deck gets so dirty from all of the dust blowing around. Again, we live in the desert. It’s always a struggle to keep it clean and not waste precious water. 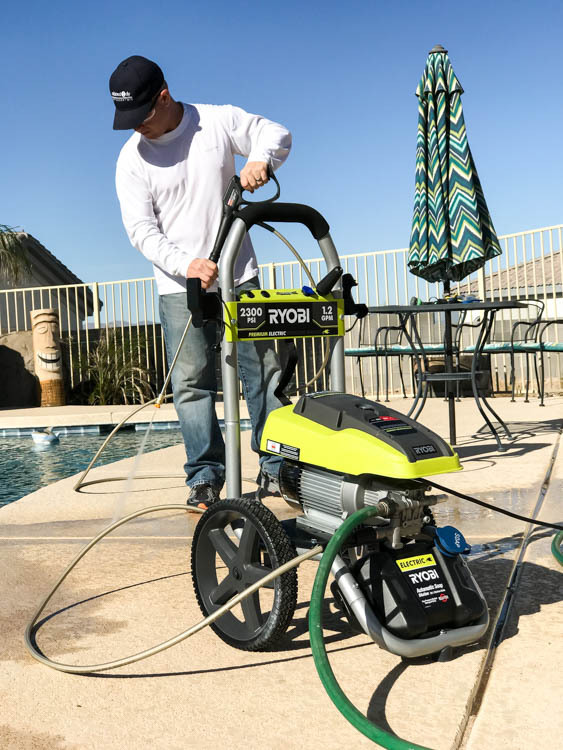 The new RYOBI 2300 psi electric pressure washer has been the best solution for us to not only keep the deck clean, but also not waste water in the process. 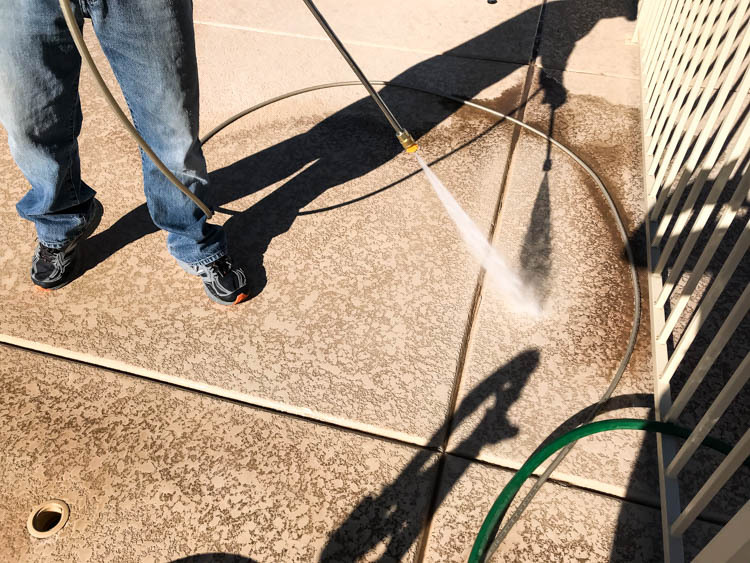 It comes with three tips, ranging from very high pressure to gentle, that you can quickly change out depending on what you are cleaning. We opted for the yellow tip, which is kind of a medium pressure so we didn’t risk chipping up any of our cool deck. What’s crazy is that our pool deck never even looked dirty, but looks can be so deceiving. It was nuts how much dirt we cleaned off of the deck and kind of gross at the same time. While my husband was cleaning the pool deck, I decided to pull out our RYOBI generator and run it for a bit. We use it on camping trips and love it! 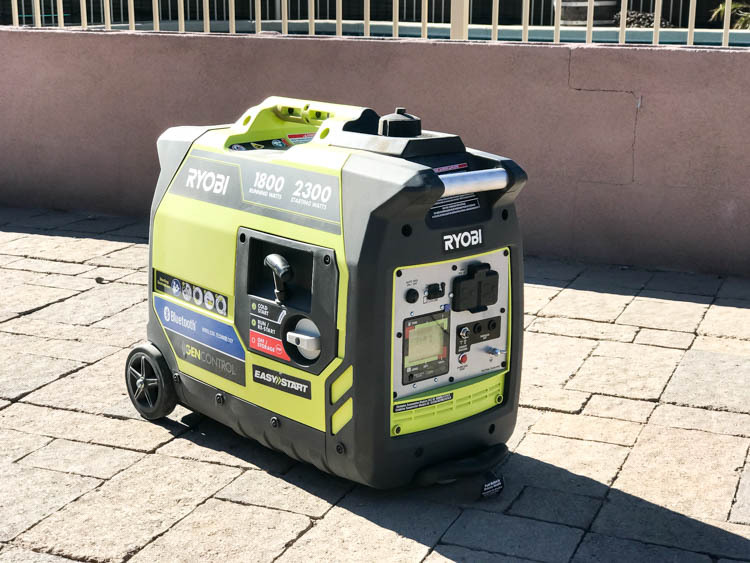 If you weren’t aware, gas motors such as generators need to be exercised regularly to keep them running well. If gas is left in the carburetor for too long, it goes bad and therefore, so does your carburetor. A good rule of them is once a month for about 30 minutes. Since we were outside anyway, this was a perfect time for us to fire it up. It’s also a good idea to put a fuel stabilizer in your tank to help prolong the life of the gas inside it, if you don’t run the motor regularly. The same goes for gas cans to fill these motors. If you like to keep a gallon or two handy, add a little fuel stabilizer to it to prolong the life of the gas for your gasoline powered tools and equipment. Oh! And my husband had the funniest discovery while he was working on the drip system! 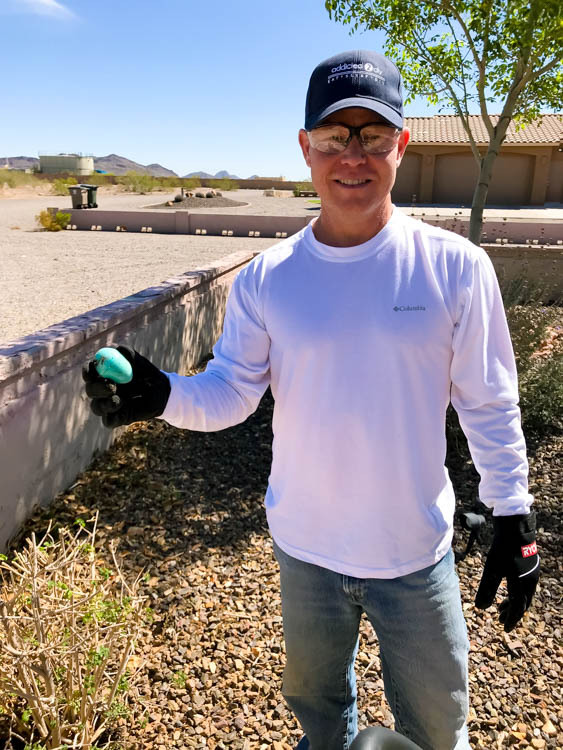 He was digging around in the rocks under a shrub and found an Easter egg from last year! Thankfully, it was a plastic one. We opened it up to see what was inside and found an empty package of jaw breakers. I have no clue what happened to them. Maybe ants? It was so weird, but so funny. I guess we’ll have to do a better job of counting eggs before we hide them this year. We’ve still got some more work to do and outdoor projects on our list this year, but we’re pretty happy with what we’ve managed to accomplish in such a small amount of time this week. Hopefully we can get the rest of our projects done before the temps reach the equivalent of the surface of the sun. 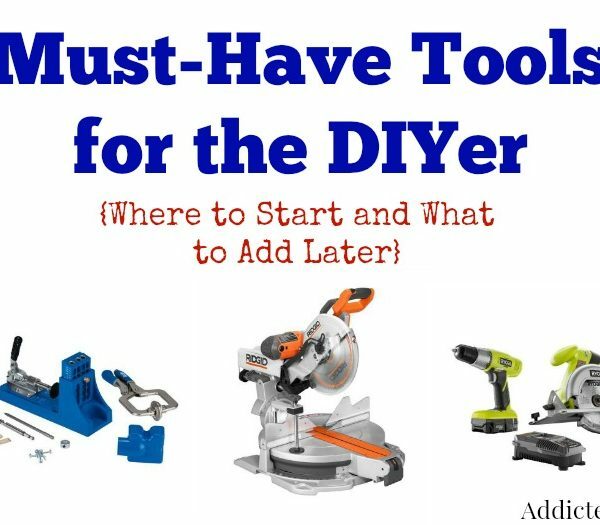 As always, whenever you’re working outside and using tools like these make sure that you and those around you stay safe. Follow all manufacturer’s instructions, wear eye protection and ear protection as needed. Also wear a mask whenever spraying chemicals. DISCLOSURE: I was provided products and/or compensation for this post. All opinions and ideas are 100% my own.